One of the things that we do at Civil Politics is help organizations conduct program evaluations as part of an effort to understand how the academic research that is largely produced in university settings translates to the real world. We recently studied an event put on by the Village Square on January 12th entitled Created Equal + Breathing Free, where the ostensibly liberal virtue of diversity was discussed alongside the ostensibly conservative issue of allowing religious liberty. The event mirrors ideas from academia that suggest that positive contact between groups can lead to better relationships, especially when the groups collaborate on shared goals (e.g. recognizing a concern that each side brings to the table). To that end, we asked people who attended the event to agree or disagree with statements about the importance of diversity, the importance of religious liberty, and attitudes toward liberals and conservatives. We asked the same questions before and after the event, to see if the event changed any attitudes and, as we have found before in such work, we found that people’s attitudes about issues are hard to change, but that people do end up liking people in the opposing group more after the event. 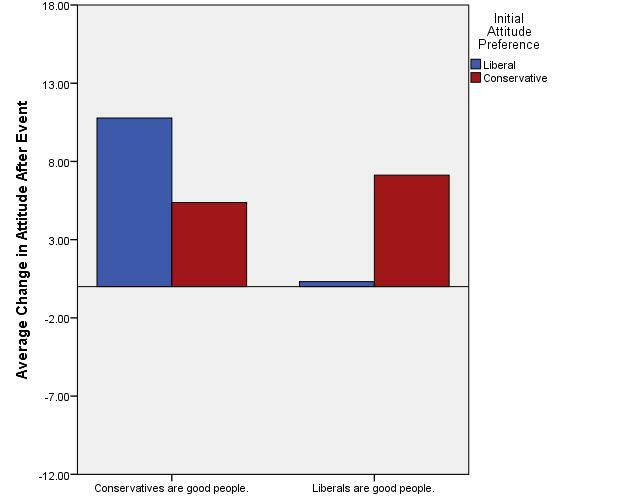 The below graph shows that attitudes toward all groups increased post-event, with the highest increases amongst those who came into the event with pro-liberal attitudes becoming significantly more likely to believe that “conservatives are good people” (see leftmost bar in the below graph). 37 people ended up completing both before and after event surveys and there was one statistically significant finding – that people were more likely to agree with the statement “conservatives are good people” after the event, as compared to before the event (+ 7.35 on a 100 point scale, t-test t=2.392, p = .022). This was driven almost entirely by the 22 people who started the event with more agreement to the idea that liberals are indeed good people, as compared to the idea that conservatives are good people (the increase was 10.8 points amongst this group), suggesting that the main effect of the event was to convince a generally liberal audience that conservatives are indeed good people too. Note that the event didn’t change anyone’s mind as to the importance of the issues or make either group want to be friends with the other. 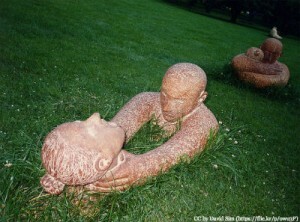 The event organizers predicted as much from their experience of the event. But perhaps the simple belief that those who one disagrees with are indeed good sincere people is a step in the right direction for a single night’s work, and for that, we thank the Village Square and anyone who brings people together in their communities in the spirit of collaboration across groups. In our experience, change often happens one relationship at a time. ps. If you’re interested in the Village Square’s take on these results, you can read more about their philosophy and their experience of the event here. “Civility,” which is the concern of this group, should therefore be examined as an intergroup, rather than interpersonal matter. What, then, does research on intergroup relations have to say about increasing civility among political partisans? I would argue that the greatest threat to political civility within a stable democracy is the “moralizing” of political discourse as it pertains to political groups. Namely, it is one thing to view your political opponent as misguided or simply wrong; it is another thing entirely to view him/her and the group that he/she represents as immoral, transgressive, or just plain evil. When placed in the latter realm, political discourse becomes decidedly less civil as the concept of “loyal opposition” becomes not only oxymoronic, but tantamount to treason. Why must we as social scientists, practitioners, and scholars be wary when political discourse becomes moralized? The simple answer is that morality is powerful. The capacity for moral judgment and moral action may be encoded into our very fiber as a species and may have been the building blocks upon which human civilization was founded (Haidt, 2007, 2012; Greene, 2013). Putting aside the ontology of human morality, a much more parsimonious reason, at least for my purposes, for why morality is powerful is that people tend to view moral values as being objectively true (Goodwin & Darley, 2008). That is, a moral statement (e.g., “It is wrong to kill.”) is perceived to be more like an empirically verifiable fact (e.g., “The Earth revolves around the Sun.”) and less like a statement of social convention (e.g., “An appropriate tip for your server is 15 to 20 percent of the bill.”). And there’s the rub, so to speak. A person’s morality is rooted in beliefs that are perceived to be as true as the Earth revolves around the Sun and which also imply a proscriptive element: not only is it wrong to kill, but one ought not to kill. A person’s moral worldview not only describes social reality but also guides future behavior as well as how future behavior is to be evaluated. One only needs to consult the work of Linda Skitka on moral conviction (see Skitka, 2010) or Jeremy Ginges’ work on sacred values (e.g., Atran & Ginges, 2012; Ginges & Atran, 2011) to see how these aspects of morality function in politics. What their work demonstrates is that we often judge the actions of others in relation to whether they reflect or confirm our moral values, even if violates considerations of procedural justice (Skitka & Houston, 2001) or our own utilitarian benefit (Ginges & Atran, 2011). The “moralizing” of intergroup relations is often reflected in the attribution of moral or immoral qualities to other groups. I am currently examining the consequences of this process as part of my dissertation. 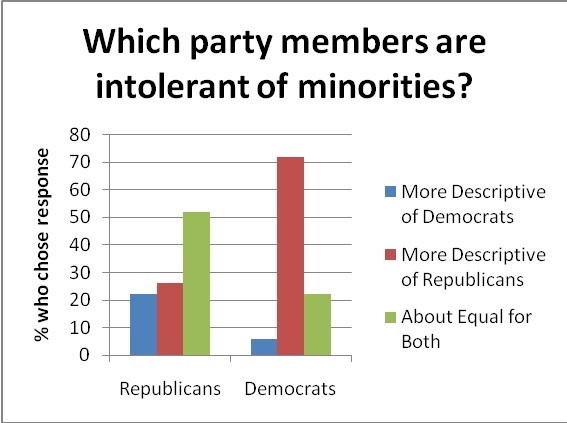 In my preliminary findings (see Pilecki et al., 2013), I have found that when people perceive that members of another group (e.g., liberals, conservatives, feminists, evangelicals, etc.) as being typically less moral than most other people they are more likely to view violence or acts of political repression towards that group as being appropriate. These findings reinforce previous empirical and theoretical work by Susan Opotow (1990, 1993, 1994) and others (e.g., Bar-Tal, 1990) on the “scope of justice,” which refers to the distinction that people make between those considered worthy of moral treatment and those considered unworthy of moral treatment. When a social group is imbued with immoral qualities by political leaders, pundits, or other “entrepreneurs of identity” (Reicher & Hopkins, 2001) that group is effectively set apart from others and, in effect, becomes a legitimate and morally justifiable target of harm rather than civil discussion. When people moralize intergroup relations they limit the potential for civil discourse to emerge as they frame political issues within the realm of sacred values, thereby making trade-offs and compromises less likely (Tetlock, 2003; Tetlock, Kristel, Elson, Green & Lerner, 2000). The words and labels we use to describe the social groups with which we identify and those that we oppose shape how we think about us, them and how we relate to one another (see Hammack & Pilecki, 2012). In other words, language matters and it is therefore incumbent for social scientists and practitioners to hold political leaders, media figures and other influential people accountable for their use of moralizing rhetoric to mobilize support, gain more viewers, and/or delegitimize criticism. Based on a scale of 10 political attitude questions, such as a binary choice between the statements “Government is almost always wasteful and inefficient” and ”Government often does a better job than people give it credit for”, the median Democrat and median Republicans’ attitudes are further apart than 2004 and 1994. On the above ideological survey, fewer people, whether Democrat, Republican, or independent, are in the middle compared to 1994 and 2004. Though it is still worth noting that a plurality, 39% are in the middle fifth of the survey. More people on each side see the opposing group as a “threat to the nation’s well being”. Those on the extreme left or on the extreme right are on the ideological survey are more likely to have close friends with and live in a community with people who agree with them. The study is an important snapshot of current society and clearly illustrates that polarization is getting worse, with the social and moral consequences that moral psychology research would predict when attitudes become moralized. That being said, I think it is important not to lose sight of the below graph from their study. Specifically, while there certainly is a trend toward moralization and partisanship, the majority of people are in the middle of the above distributions of political attitudes and hold mixed opinions about political attitudes. It is important that those of us who study polarization don’t exacerbate perceived differences, as research has shown that perceptions of differences can become reality. Most Americans (79%!) still fall somewhere between having consistently liberal and consistently conservative attitudes on political issues, according to Pew’s research. And even amongst those on the ends of this spectrum, 37% of conservatives and 51% of liberals have close friends who disagree with them. Compromise between parties is still the preference of most of the electorate. If those of us who hold a mixed set of attitudes can indeed make our views more prominent, thereby reducing the salience of group boundaries, research would suggest that this would indeed mitigate this alarming trend toward social, moral, and political polarization. 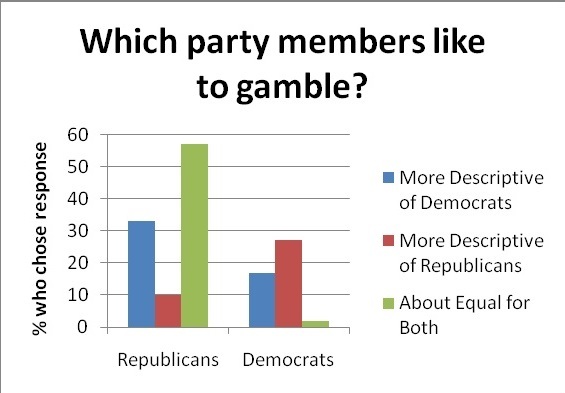 How do Democrats and Republicans view their political opponents? 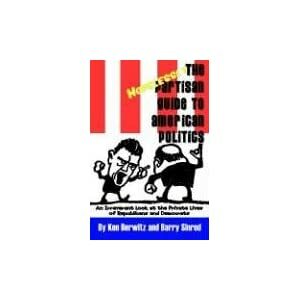 Ken Berwitz and Barry Sinrod investigate this question in The Hopelessly Partisan Guide to American Politics: An Irreverent Look at the Private Lives of Republicans and Democrats, a lighthearted publication examining Democrat and Republicans’ answers to surveys discussing everything from their favorite type of movies to whether they organize the bills in their wallet. The survey reflected that people generally believe the differences between Democrats and Republicans extend beyond their political opinions (for example, most agree that Democrats are more likely to go out on the town on the weekend, and Republicans are more likely to stay in). In fact, previous psychology research has indicated that meaningful and stable disparities in personality do exist across party lines. Conservatives, for instance, tend to score higher on the “conscientiousness” factor of the “Big Five” personality traits (items concerned with self-discipline, organization, and planning), and liberals tend to score higher on “openness to experience” (items indicating an interest in art, emotion, curiosity, and imagination). 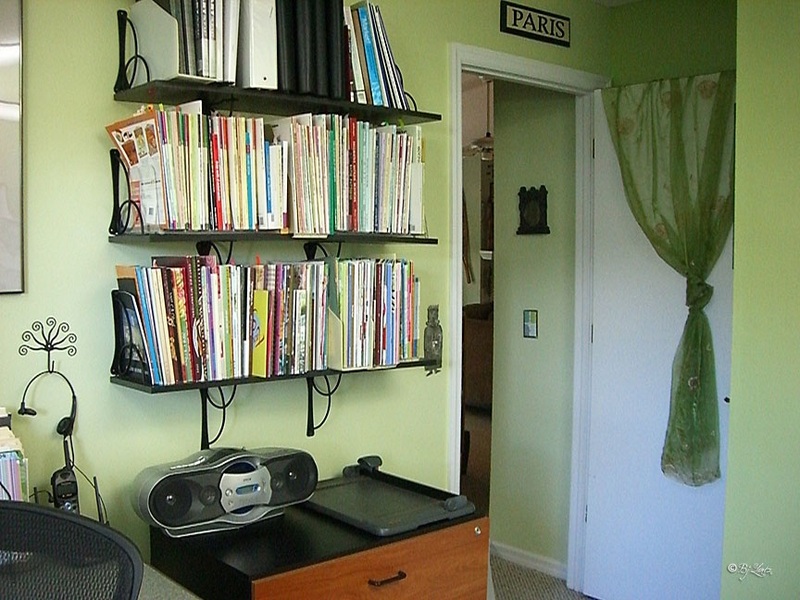 These differences have been explored in research by psychologists Carney, Jost, Gosling, and Potter (2008), who examined the offices and bedrooms of liberals and conservatives for cues to their personality, and found that liberals were indeed more likely to have items in their room indicating an interest in novel experiences and creativity (e.g., books about travel and music, art supplies, international maps), and conservatives items indicating organization and cleanliness (e.g., calendars, laundry baskets, ironing boards). Liberals and conservatives seem to be correct in recognizing that their political counterparts have distinct interests and personality traits. While these perceived differences are relatively innocuous, liberals and conservatives frequently see members of "the other side" as dissimilar in a very negative light. 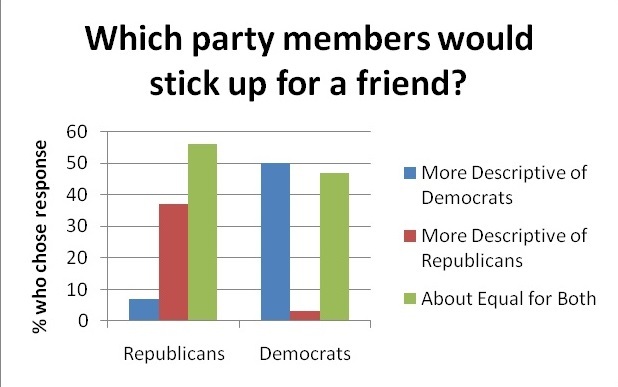 TheHopelessly Partisan survey takes a more somber turn when the authors asked respondents to describe the characteristics of members of the opposite party. The findings, while perhaps not surprising, shed light on challenges to positive bipartisan interaction. First and foremost, we see that people are rather unwilling to accept their political opponents as well-meaning individuals with cogent beliefs. Out of all of the insults hurled at members of the opposite political party (for instance, Republican “warmongers” and Democratic “freeloaders”), one of the most frequent epithets was “liar.” Dishonesty was heavily attributed to those who disagreed with one's political opinions. 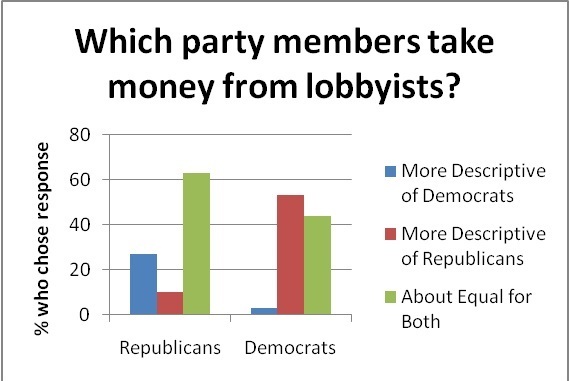 Opponents were continually ranked as having suspect motives – for example, they were more likely to be suspected of taking bribes or accepting money from lobbyists. In these examples, we see further evidence of the “mirror image perception” phenomenon, in which opposing ideologues have nearly identical stereotypes of one another. 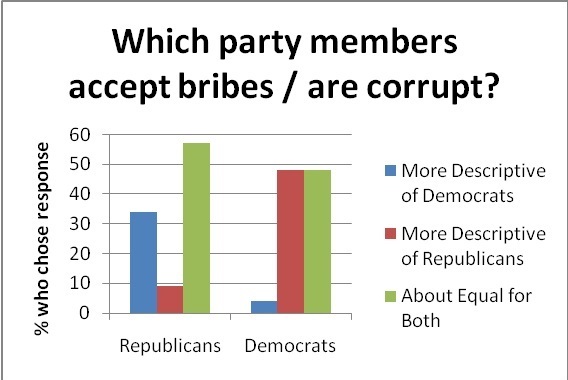 Corrupt motives are attributed to the side that opposes us; our ideological peers are seen as upright and virtuous. 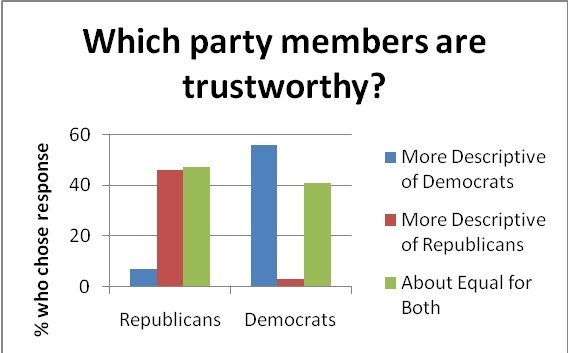 Why are we so inclined to distrust our political opponents? Individuals are highly motivated to defend important, self-related beliefs. Previous research on the “belief bias” has illustrated the conflict between logic and belief in deductive reasoning: individuals tend to reject arguments that are logical, but with which they disagree, and accept arguments that, albeit flawed, are consonant with their personal beliefs. Through rationalization, people then justify overlooking potentially logical arguments that don’t match one’s own ideas. Furthermore, a source credibility bias can influence our decision making. While we are readily willing to accept an opinion asserted by someone we like and admire, we refute those issued by people or groups we dislike. We can, perhaps, readily justify ignoring an argument by attending instead to the character of the person delivering it. By viewing those who contradict us as unreliable sources, we quell any chance of having to seriously consider their arguments. Discrediting the proponent of undesirable viewpoints could be accomplished quite easily by asserting that the person is deceptive – thus the frequency of “liar” in heated political discourse. Furthermore, people seek out evidence that confirms what they want to believe rather than rationally assessing all of the available information. When told that extraversion was an especially desirable trait, people generated more memories of instances in their lives where they were extroverted; when told that introversion is preferable, the effect flipped, demonstrating a clear confirmation bias in individuals’ thought processes. Social psychologist Jonathan Haidt discusses how this occurs: When evaluating a statement congruent with our beliefs, we ask ourselves, “Can we believe it?” and require only a minimal amount of plausibility before we accept the argument as valid. On the other hand, when encountering an assertion that challenges our beliefs, we ask ourselves, “Must I believe it?” and need devise only a single crack in its foundation in order to cast it aside. For example, a person inclined to dislike Obama hears that people have had trouble tracking down his birth certificate. They ask, can I believe that Obama is not a natural born citizen?, and see the alleged missing birth certificate as sufficient evidence. On the other hand, when the birth certificate is posted online, potentially refuting these arguments, the person asks, must I believe it?, and instead labels the birth certificate a forgery, as a "short-form" and invalid certificate, and so on. People tend to search for information that supports important, self-referential beliefs, disregarding information that contradicts them. And in the information age, the Internet is ready to provide dozens of “sources” that can offer evidence for any number of theories, from those insisting that planted bombs caused 9/11 to those claiming Obama is the Anti-Christ. Fortunately, research has indicated that motivated reasoning has its limits. When presented with conflicting information about a candidate in a mock presidential primary that they originally supported (e.g., a pro-choice individual discovered that the candidate was pro-life), people initially responded along the lines of motivated reasoning, increasing their positive attitude towards the candidate and ignoring the contradictory information. On the other hand, as the amount of incongruent information learned grew, people began making adjustments to their evaluations of the candidates, appraising the situation more accurately and taking more time to review the information they were given. Although people are initially predisposed to excuse their politician of choice's faults, they don't appear able to gloss over everything. See, for example, this quote from a once-ardent Obama supporter: "Now after over 6 months in power, after the novelty has worn off, after months of 'Yes We Can!' should have become 'Yes Let's Do It! ', we all realize that the person that we supported is really a centrist who plays a Progressive on TV." People can reevaluate and re-frame their beliefs. However, as illustrated in The Hopelessly Partisan Guide,aspersions about “the other side” reached far beyond a political context. Democrats and Republicans were willing to attribute all sorts of vices to the others and, in turn, claimed the moral high ground for themselves. 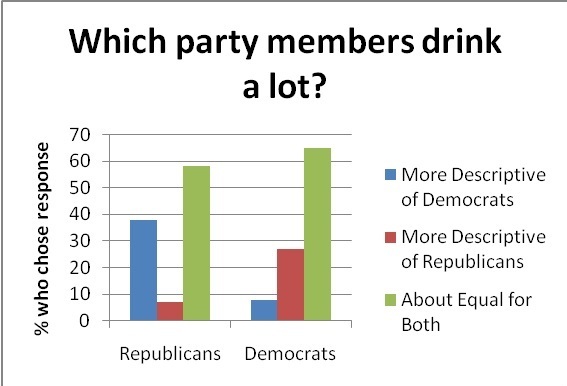 For example, Democrats and Republicans asserted that they drink less, enjoy gambling less, and are more tolerant of minorities (Democrats demonstrated an especially marked bias in this case) than their counterparts. In a reverse halo-like effect, partisans attributed all kinds of immoral characteristics beyond mendacity to their opponents. With this thorough “de-moralification” of our political opponents, it’s not surprising that politicos can hurl such insults at one another, and, in an extreme case, profess not to care if their opponent died in front of them. 95.4% of Americans recently polled asserted that civility is important for a healthy democracy – and many aver that problems of incivility might be solved by cross-party interaction. For example, 85% of Americans surveyed believe that politicians should work to cultivate friendships with members of the opposite party. 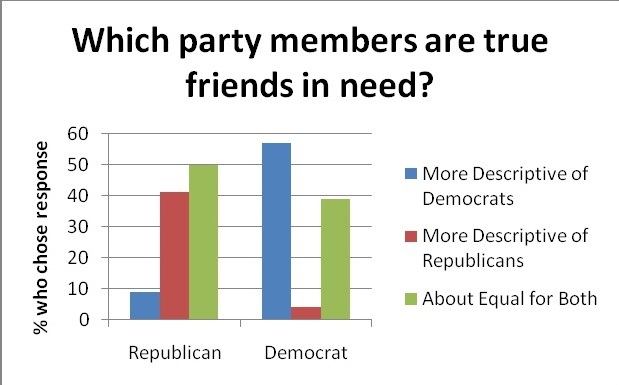 However, it seems some are disinclined to freely associate with political others – Hopelessly Partisan data indicated that people tend to think political kin make better friends. Psychological research has long validated the notion that “birds of a feather flock together” – rather than opposites attracting, people like those who are attitudinally similar to themselves, and even deem them more moral individuals. Since people might be less inclined to form bipartisan friendships on their own, some assert that the workplace might actually be the best place for cross-cutting political discourse. Self-selection has begun to occur in neighborhoods, churches, and community organizations, as people group themselves with people who are ideologically similar; however, this self-selection generally cannot occur at work. 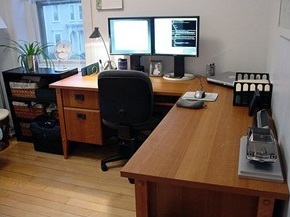 Political scientists Mutz and Mondak (2006) found that dialogue between ideological opponents increased at work, resulted in a greater awareness of rationales for viewpoints other than one’s own, and that there was an association between political tolerance and the number of political discussion partners one had at work. Perhaps, then, public places like the workplace and schools could be used to foster civil interaction. Many Americans echoed this sentiment in a recent survey, with 77% stating that schools should teach respect in politics, and selecting local schools as the best way to promote civil politics. Is politics hopelessly partisan? Sometimes it might seem so, when even the most well-educated and intellectual individuals instantly label members of the opposite political party as insane and idiotic. However, considering that motivated reasoning doesn't appear to persist in the face of everything, there is hope that judgments of our ideological opponents could also be corrected. Most of the research on reduction of bias and prejudice has focused on race and sexual orientation, but perhaps some of the same techniques could be implemented to assuage cross-party polemics. Given enough examples of well-meaning and reasonable individuals with whom one disagrees, one might be able to view "the other side" with less hostility. Conservative Ken Berwitz is a native New Yorker and the President of Ken Berwitz Marketing Research (KBMR) and National Qualitative Centers, Inc. (NQC). He has been involved in executing, writing, and speaking about qualitative and quantitative research for over 35 years. Liberal Barry Sinrod has conducted surveys in the marketing and research community for nearly 40 years and writes for the Boca Raton News on a weekly basis.